Actually, I never, ever want there to be a film staring my favorite film character to be bad. It's just that after the disappointment of "Kingdom of the Crystal Skull" last year, I'm somewhat sceptical. And if you believe I'm just looking for Lucas to fail, take a look at my post before the film came out. I was truly excited. I wanted it to be great. In fact, I don't hate the film like many of my friends do. I just feel that it's so below what should be an Indiana Jones adventure. He deserves better than the fourth film. Heck, he deserves better than the third film. "The story for the new Indiana Jones is in the process of taking form. Steven Spielberg, George Lucas and myself are agreed on what the fifth adventure will concern, and George is actively at work. If the script is good, I'll be very happy to put the costume on again." I'll keep my hopes dampened until I hear or read the script and find out more information about it. I hope if a Fifth film happens it's got a fantastic script and I hope they get it done quick. If Lucas takes as long as he did for the last one we'll wind up seeing Indy using his whip to pull his wheelchair into the nursing home. Hat Tip to Latino Review and Ain't It Cool News. Honor, I too was similarily disjointed by KotCS... Indy is one of my idols that got ne into my adult career... so the... problems that KotCS had really got to me. But, in recent months I've been slowly watching the DVD... and letting the film warm on me. Certain things have warmed up to me... while a few still have yet to. I'm willing to give Indy one more go. But this film needs to be Indys last. No more. I think they need to take a ToD approach to this next one and have Indy be off on his own, away from the school, away from the family (show them in the beginning as a goodbye or perhaps even on a phone call or something) but have Indy be Indy. Throw in some Sallah and go for one last great Indy adventure. I still hate KotCS for ruining the mystery of the macguffin... Raiders, power of god, don't show god. Temple, power of Shiva, don't show Shiva. Crusade, power of Christ, don't show Christ. Kingdon, power of off-worldly beings, WHY SHOW THEM?!!?!? Apeaking of the dead I'm surprised Honor hasn't posted about Patrick Swayze's death yet. Please, please no more Shia. He's an idiot for saying he didn't care about pleasing the Indy fans who were dissapointed in the Kingdom of the Crystal Skull. My opinion is that the 4th movie wasn't terrible, but dissappointing. It would have been a great movie by itself if it was just "kingdom of the Crystal Skull" and was not an Indy film. Crystal Skull was a travesty. Luca$$ must be terminated with extreme prejusdice. I guess I'm in the minority in that I enjoyed Kingdom of the Crystal Skull. I think that might have been because I wasn't even trying to compare it to Raiders or even Last Crusade. To me, it was just a chance to get back in the theatre and screw around with an old favorite. I don't know if humour was what Lucas was going for, but I was laughing uproariously. OF COURSE Indy survives a nuclear bomb... HE'S INDIANA JONES!! ^_^ Maybe not taking it at all seriously was the way to go about it? I think the bothersome thing about Indy 4 to me was that no matter how many times "the script needed work" (and thus went through yet another rewrite), they never quite got the hint that maybe it was the Area 51 (and aliens, i don't care if they're "pan-dimensional" or whatever) idea that was the problem. It always reminded me of that Warner exec that Kevin Smith tells about, the one who tried to get him to write in the giant spider, and refused to give up on that damned giant spider until it finally destroyed any chance of any of the cast or crew actually taking Wild Wild West seriously (where that very same exec finally got his damned spider). Afrea 51 wasn't necessarily the problem, it was how far they took it. Again going back to my 1st comment on here. In all the other films they do not show the upper being behind the power of the macguffin... and in KotCS they did. Well you can't really show God now can you? George Burns is dead. Lose the Bluesky Indy font Scoop. 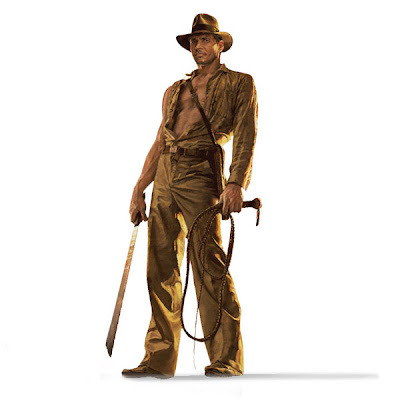 You better photoshop that sword in Indy's hand with a walking cane first. Perhaps you should write something about Indy's fifth adventure? Indiana Jones and the Nursing Home of Doom.